Greetings anglers! Another week and some more flooding for some of us to deal with. Luckily, the forecast looks somewhat drier this week, and will allow those impacted by some flooding to dry out perhaps. It will also allow us to get out on the water again. The Otter in Middlebury is close to 6000 cfs, the likes of which haven’t been seen since Irene. It may be quite sometime before the Otter in this neck of the woods is fishable. However, as some food for thought, after Irene, once the Otter cleared and one could find some softer water, the fish were definitely there. The Otter tribs, being smaller watersheds get down to fishable levels much quicker. I was able to get out on Friday before the rain on both the Midd and New Haven and found some willing fish in both systems. The trout I caught didn’t seem to be keyed in on any one fly as I landed fish on a girdle bug, worm, small white bugger and a frenchie. They were however, associated with soft water next to a good current seam. With water temps in the mid 40’s to low 50’s those areas are good place to start prospecting for some action. I also saw a bunch of the early stones hatching as the day progressed on Friday. With cool nights coming up, keep that in mind for the afternoons this week. And with clearing water as the week progresses, I would tend to more natural looking flies. But of course, the streamer game could get going strong soon. Whether dead-drifted , swung or stripped, early season is always a good time to throw some meat around. I’ve also heard some good reports from Lake Champlain tribs, as when the water is in good shape, folks have been getting into steelhead. With every push of water, more fish should be entering the systems. As you can see, spring has lots of options for fishing out there, and in my humble opinion the best time to fish Vermont. Yes, it can be hit or miss (especially with water conditions) but fish are hungry from a long winter and having shots at multiple quality fish before the stocking trucks arrive make it that much sweeter. If you do get out, be mindful of changing wading conditions and be safe. As always feel free to send me questions, comments, etc. dave@mmvt.com. Be safe out there and have some fun. Its been awhile, but I thought I would jump in for a guest fishing report, OCC update and some overall thoughts for a successful early season on the water. It is without a doubt a very exciting time of the year. With the winter months all but behind us, we are looking into the slow but sure entry into warm weather and good fly fishing ahead. 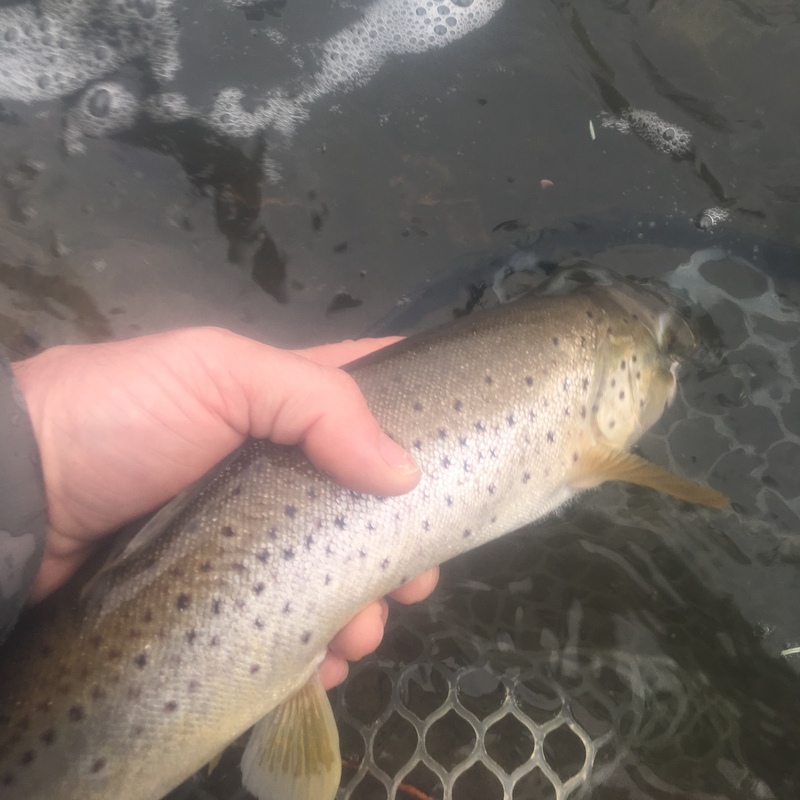 I have always felt that April was the most brutal month in VT.
General fishing report for March 29, 2019. Since we’ve last spoke we’ve lost some snow, gained a bunch in the mountains and started losing some again. The extended forecast looks to keep the melt going, but it doesn’t seem that we’ll have any huge runoff issues, not yet at least. For me personally, I have not been out recently, but perhaps this weekend. The Otter is a bit high and looks like it’s rising, but if you can find some slower water (but still moving) near some deeper winter holding areas that would be a good place to start. After a Busy weekend of guiding and personal fishing, here’s what the guides have to report and what to look forward to. First off, just two more weeks left of the regular season! If that doesn’t get you motivated to get out and enjoy some fall fishing, then I’m not sure what will! Last weeks rain definitely had the fish in an eating mood, but it was hard to pin down any one fly that did the most work. Worms worked in the more off color water, as did nymphed and swung streamers, but as things cleared, more natural bugs like October caddis patterns and Pt’s did the work. Greetings Anglers! I hope everyone is able to get out and enjoy this beautiful state that we live in! Despite the dry summer it seems that the trees don’t really care and are putting on quite the display for us. And we are getting rain, which makes the trees and us happy right? The recent spell of rain seems to have got the fish (trout) kicked into feeding mode, especially on the tribs. After a couple slow days on the Creek, I had a productive few hours on the Middlebury today, with nicely stained water and a ton of leaves to catch! Hello Folks! Happy Fall! We did pick up some much needed rain this week, some areas more than others, but after a long, dry summer every bit helps. Locally the Otter seemed to have been the big winner, compliments of some significant downpours in the Rutland and northern Rutland County areas. Levels have seemed to plateau, and despite the big bump in levels, clarity is pretty good. Tribs did see a bit of a bump in levels, but are still low. Water temps have settled back as well. Greetings Anglers! While we are still in low water mode, the outlook looks promising. Cooler temps and shots of rain all next week should help the fishing out there. We were out today with a four person guide trip and found some low 60’s on the lower New Haven and upper 60’s on the Creek. We found many species other than trout on the Otter, but fun none the less. In my experience, once the Otter water temp gets in the lower 60’s, the trout become more active. Until we get really colder temps, they are usually found still in the faster water. Howdy folks! With some well deserved relief from the heat and much needed rain on the way, things couldn’t be looking better on the local fishing scene. Many Otter tribs started the day in the low 60’s, but are still low and clear. The Otter itself was still a touch over 70 early this morning in the Middlebury area, but I found some mid 60’s further south on the Otter. Some Iso’s, and a few caddis were around. Fish seemed to like the standard Iron Lotus, rainbow warriors, and frenchies. Pretty much what has been producing fish for people the last few weeks. Greetings out there anglers! As we turn the corner to September, we’ve got some very similar conditions out on the local rivers. Otter tributaries are low and clear, and although this morning was chilly, it looks like we have a bit more heat and humidity to deal with in the coming days. I was able to get out on the Middlebury River this morning and found a cool 62 degree water temperature in East Middlebury and was able to pick up a few fish from the faster pocket water in that stretch. Most fish came on size 14-16 frenchies.